New Delhi: China has altered its boundary with Bhutan, a year after the tense 71-day face-off with India in the tri-junction area of Doklam had prevented a similar attempt. Analysis of satellite imagery by ThePrint has found that Beijing has managed to effect this change through frenetic activity through last winter and the monsoon season. At the Doklam plateau, India’s boundary with Bhutan has now become the de facto boundary with China. This is a change of status quo. China has been envious of the India-Bhutan relationship. But it is yet to establish formal diplomatic relations with Bhutan. The problems for Bhutan began when China sent in People’s Liberation Army troops to construct roads and started occupying Bhutanese territory in 1988. China was elated when the pleas of the tiny Himalayan kingdom fell on deaf ears — the international community practically took no cognisance of Bhutan’s complaints. Chinese consternation increased when the Karmapa Lama, head of the Kagyu Sect of Tibetan Buddhism, who was raised under their watchful eyes, escaped and reached McLeodganj in Himachal Pradesh, the seat of the Dalai Lama. China was angrier still with India’s dissent and refusal to join the CPEC (China-Pakistan Economic Corridor) and OBOR (One Belt, One Road) initiative. 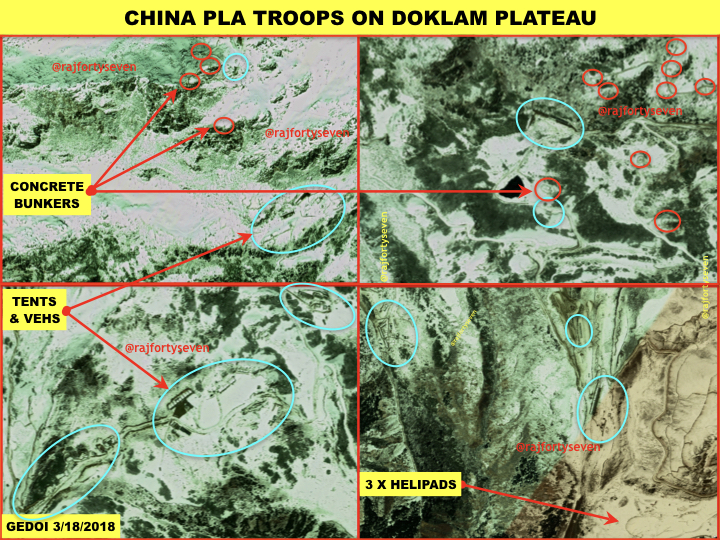 It has been a year since China’s intentions in Doklam were exposed by ThePrint. But things have since changed. Here is ThePrint analysis based on satellite imagery. Given the development of military infrastructure around Doklam, it can be assessed that China has been preparing for this for the last four years. 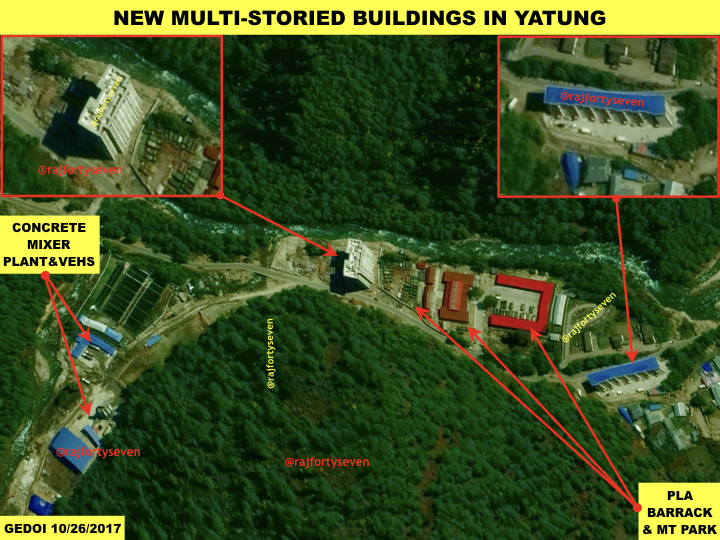 A large number of high-rise buildings were constructed for the PLA in Yatung, the largest town in the Chumbi Valley, after mid-2016. One of the buildings is eleven floors tall. It was built between May and October 2016. The occupation of Doklam was planned well before April 2017. 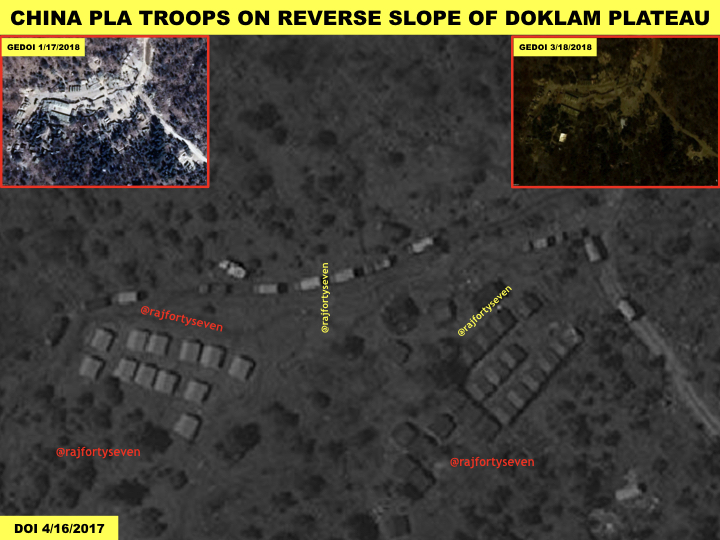 It can be observed from satellite imagery of 16 April 2017 that at least 16 large vehicles and 40 tents (amounting to 400 troops) are located on the reverse slope, barely 2 km from the Doklam plateau. The reverse slope runs from the southwest to the northeast of the plateau. It is not visible from Indian and Bhutanese posts. This indicates very strongly that the Chinese troops here were awaiting orders from headquarters before they occupied Doklam. The same location on the reverse slope throughout the winter months has been buzzing with activity, Google Earth images from 17 January 2018 and 18 March 2018 show. The plateau remained active through winter. The movement of the PLA continued unabated. Snow clearance was observed at all the tents, vehicles and semi-permanent structures. The concrete bunkers, well connected with communication trenches, were kept clean of snow. The engineering equipment remained in place, but mostly inactive. The vehicular movement was obviously reduced due to snowfall. 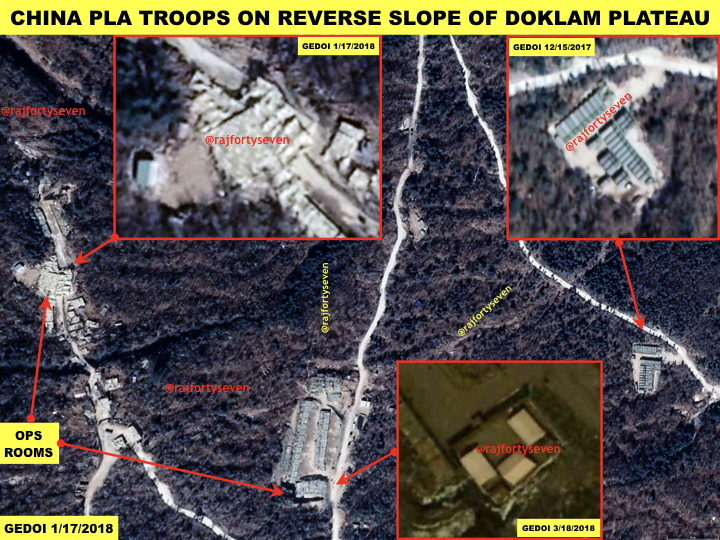 The entire winter saw hectic activity on the reverse slope of Doklam Plateau. The area cannot be observed directly from India or Bhutan. 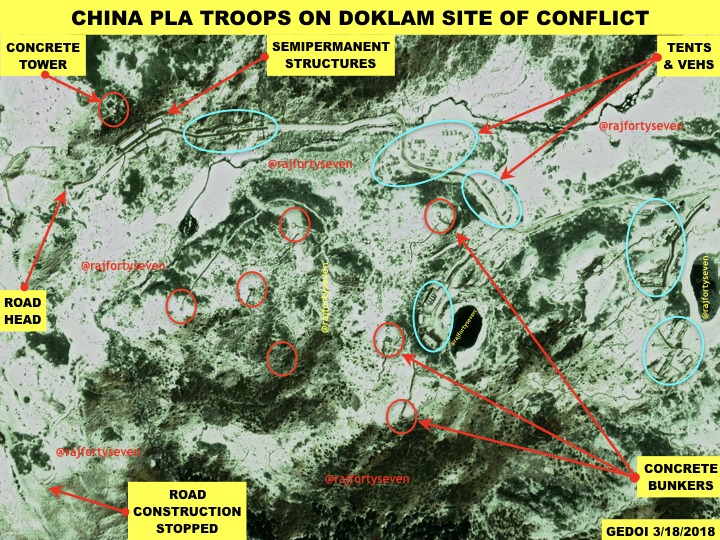 The area where PLA had created a base in April 2017 just months before the occupation of Doklam has increased at least threefold. This location is possibly being used as an administrative base. The PLA has established two more posts with large numbers of tents and vehicles. There are two large reinforced permanent structures of size 16m x 20m. 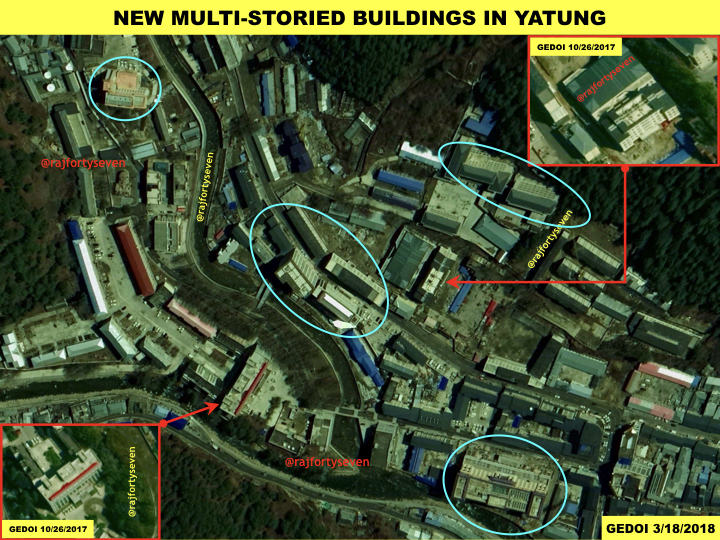 These are possibly operations rooms or command and control facilities. Two more areas on the reverse slope have been cleared of trees and foliage, probably to make space for vehicles to park. China’s strategy to occupy the Doklam Plateau seems to be inspired by the warrior-philosopher Sun Tzu — it approached an area that India least expected the PLA to occupy. Despite many military officers insisting that China will not attempt aggression in Doklam because it is observed by Indian posts, China has definitely dug in its heels here and altered the boundary at the tri-junction with India and Bhutan.